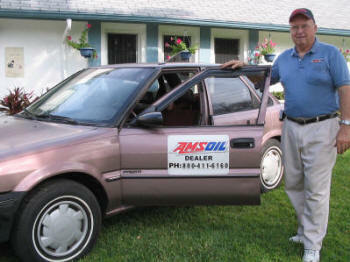 This is my 1992 Geo Prizm which has gone over 254,000 miles with only 10 oil changes and 20 filter changes. I purchased it new in June of '92 and, after 3000 miles, converted it over to AMSOIL 10w/30 motor oil after first flushing the motor with AMSOIL motor flush. I also installed an AMSOIL 2-stage air filter at the 5,000 mile mark. The engine is a 1.8 liter 4 cylinder which has never had any major engine problems in over 254,000 miles. The valve covers have never been removed, and if you remove the oil cap and look inside, it is just as clean as the day I bought it. At 30,000 miles I changed to AMSOIL automatic transmission fluid and have changed it four times since. After owning the vehicle for one year, I changed the engine coolant to AMSOIL Bio-Degradable Antifreeze that I replace at two year intervals. I use a 16oz bottle of PI Gasoline Additive every three or four months and clean the fuel injectors and linkage at 30,000 mile intervals with AMSOIL Power Foam Carburetor and Engine Cleaner. At 200,000 miles I changed the oil to AMSOIL 10w/40. This vehicle has truly been given the AMSOIL treatment and still runs like a top! 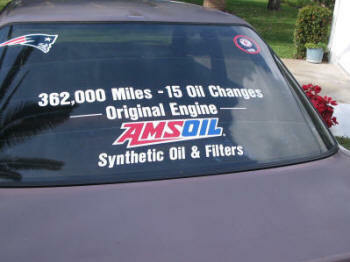 It's a rolling testimonial to the excellent quality of AMSOIL products! I plan to keep this vehicle until it literally dies. I will keep you all posted after it crosses the 300,000 mile mark. Thank you Mr. Amatuzio for formulating the best lubricants that money can buy!